When you’ve spent a lot of money on the perfect bike, the last thing you want to do is lose it by not having it secured with the right lock. Having the right lock can be the difference between knowing your bike is safe and coming back and finding that it’s been stolen. With all of the different locks on the market, it will be very beneficial to you to know the differences between them and choose the one that is the best for your bike, lifestyle and where you will be leaving the bike. The best way to judge the quality and security of a bike lock is to check the Solid Secure Rating. There is a three tier security grading system that Solid Secure uses. The Gold rating is for the locks that offer the highest level of security and it goes down from there to silver which combines security and cost and Bronze which offers some protection but isn’t fail safe. You want to purchase the best lock you can for the money you want to spend. We’ve provided several tools for you to use in determining what the best bike lock is. The first are these reviews of the top rated bike locks on the market. These three locks have proven that they are superior in performance, durability, security, and anti-theft properties that will keep your bike safe. The second tool is a detailed buyer’s guide with information on how to choose the best bike lock. These tools will help guide you to the best bike lock you can get. 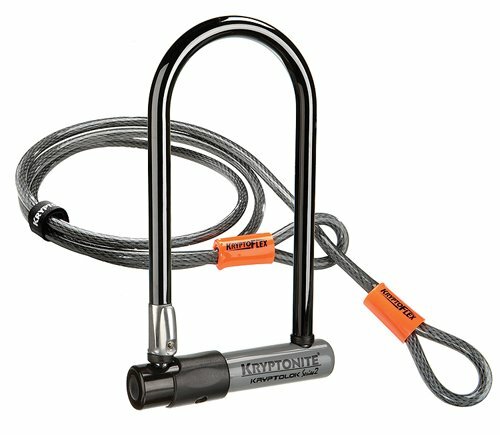 Kryptonite U locks provide bike owners with extreme security without adding bulky size and heavy weight. It has a security rating of 6 out of 10 and has a Kryptoflex looped cable that is 4’ long that adds a tremendous amount of protection. U locks are the most commonly purchased by locks due to their durability and high level of security and protection. The 13mm hardened performance steel shackle is resistant to attacks and resists cutting. It has a high security bent foot design that offers bike owners serious protection against thieves. The Transit FlexFrame Bracket mounts easily to the frame tubing that ranges from 25mm to 80mm and works with round, oval, triangular or square tubing. This lock is pick and drill resistant as well. The 360 degree rotation provides a more secure fit and will align with the bike’s frame much more closely. It comes with 2 keys. 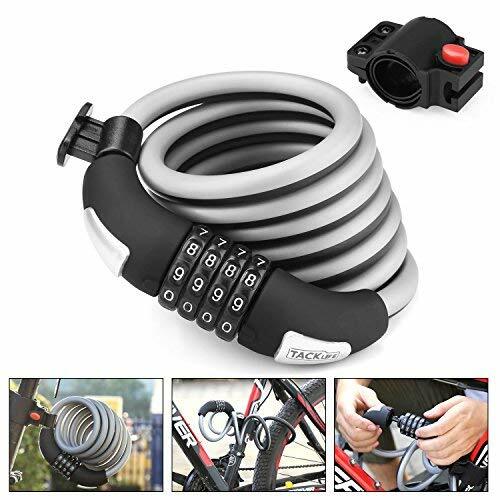 This heavy duty smart security lock is the perfect way to keep your bike safe and sound. The self coiling, resettable combination cable lock offers users high cable performance with its strong, woven steel cables that resist against cutting. The vinyl coating protects your bike’s frame from getting scratched while it is locked up. This safety lock is strong and compact making it very easy to carry the lock in your bag or purse. The combination lock offers 5 digits and 10,000 possible combinations so the code is virtually impossible to crack. To take advantage of the keyless convenience, just set your own combination in the combination mechanism. The cable lock pin is made from waterproof metal and the flexible mount holds the lock to your bike securely. The 6’ long, virtually unbreakable cable provides plenty of security and protection for your bike and will not lose its shape even when the temperature reaches 40 degrees. It comes with a 1 year warranty. 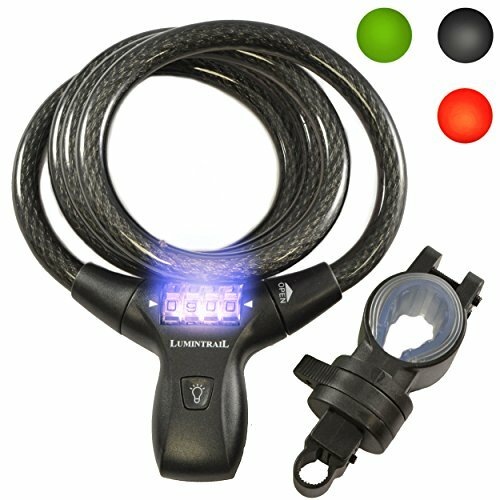 Users won’t have to worry about keys when they purchase this Lumintrail Bike Combination Cable lock with LED. No more worries about not being able to see the combination. The integrated 4 digit LED combination with resettable combination lock and an indexed number dial to ensure error free combination setting. This military grade braided steel is pick and drill resistant and is self coiling and ready to be up and out of the way. The lockdown deadbolt can’t be picked or pried open. Thanks to the LED feature, you won’t need an additional light source when locking or unlocking the lock. The 12mm steel is very easy to loop through your front wheel and frame to keep your valuable bikes safe. The self coiling cable is very lightweight and easy to store as well. The included frame mounted lock carrier males carrying the lock in your backpack or bag easy and weight. The company guarantees the customer’s satisfaction with their 100% satisfaction guarantee and it also carries an Industry Leading Lifetime Guarantee. All three of these heavy duty cable bike locks add a high level of security for your bike. The Kryptonite Kryptolock provides plenty of peace of mind with its 13mm hardened steel cable and Transit FlexFrame bracket that fits to your bike frame regardless of the shape of the frame. The TACKLIFE and Lumintrail locks also provide heavy duty steel cables and plenty of features that make them excellent choices to secure your bike. Continue reading our buyer’s guide to learn the ins and outs of choosing the best bike lock for your bike. With the information contained in this guide, you will be able to sort through all of the choices available and make an informed decision that will keep your bike safe no matter where you secure it. D Locks- D locks, also called U locks, are the most durable lock available. They will vary in weight, solidity, length and features. D locks or U locks as they are also called will lock your bike securely to any non-movable object. Just loop the cable through the wheel and frame, secure it to whatever non-movable object you choose such as a post, bike rack, telephone pole or some other secure place and lock it. Your bike will be completely safe and resistant to all kinds of attacks including picking and cutting. Chain Locks – A chain bike lock is made from anodized chain that is covered with plastic to protect the chain from rusting and also to keep it from scratching the frame of your bike. This type of bike lock is available in a variety of lengths and thicknesses. Most chain locks are rated using the Solid Secure ratings. Chain locks can be keybased or combination based. Some don’t like chain due to the fact that is can be cut with bolt cutters easier than the twisted cable locks can. Cable Locks – A cable lock is much more flexible than a chain lock and comes in longer lengths which provide a lot more versatility for the user. Cable locks are designed with intertwined metal fibers that are covered in plastic to prevent rust. Cable locks are available in key and combination models and are perfect for carrying with you in a backpack or bag due to their light weight. No lock is 100% failsafe, so in the event that someone does steal your bike, you can give yourself some additional protection by using a marking kit. This type of kit can help the police identify your bike if it is recovered so you can get it back. Sometimes police departments offer free marking services, so you can ask your local station if they have anything of this nature. Where you choose to leave your bike is very important in regards to keeping it safe. Side streets, alleys and secluded places should be avoided as places to leave your bike even with a lock. Look for places that have heavier foot traffic and good lighting. This will discourage anyone from trying to steal the bike because it is out of eye sight. There are two types of locking mechanisms that bike locks use: key locks and combination locks. Keyed locks will either have regular flat keys or cylindrical keys. The older cylindrical locks used to be able to be picked easily but advancements in design have eliminated this problem and now either type of key is good. Bike locks that are keyed come with two keys so you will have a back up if needed. Keyed locking systems are usually found on U locks and sometimes cable and chain locks. There are a few things to consider when it comes to choosing the right bike lock for your personal needs. These are things that you want to look for when you start searching through the different locks that are available. We have outlined these considerations below. Ease of Use – Once you get to where you’re going, you’ll need to lock your bike to something solid and immovable. This usually requires you to hold the bike up against the object you are locking it to. Make sure that the lock you choose is easy to use and doesn’t require both hands to work, if at all possible. If using the lock is really complicated, chances are you won’t bother with it and that increases the chances of your bike being stolen, even if you only leave it for minutes. Weatherproofing – Make sure that the bike lock you choose has protection from the elements. At some point the bike will be locked up in the rain or snow and it can rust if it is not weatherproofed. The major place that weatherproofing can come in handy is around the key barrel where rust can cause the key to not work at all. Lightweight – Since you will have to carry your bike lock with you when you’re riding, you don’t want to have to lug around a heavy, big lock. In general, the heavier the lock the more secure they usually are. There are some locks that come with special brackets that they can be attached to the bike frame. You will need to make sure that using the bracket to hold the bike lock is secure and you’re not in danger of losing the lock because the bracket fell off. These security tips will help keep increase the safety of your bike whenever you leave it locked up. Lock your bike every single time you leave it, even if you think you’ll “only be a minute” It doesn’t take but a second for someone to swipe it. Always keep the cable or shackle tight. Slack can be used against you, especially by an experienced thief. Don’t make the lock mechanism easy to get to. It may be a little bit of inconvenience to you to get it locked and unlocked, but if it is not easy to reach, it could deter them from even trying since it would take them longer to work with the lock. Don’t secure the bike to something easy to break such as a wooden fence or tree. Use immovable and unbreakable things such as concrete poles, telephone poles, bike racks and other large, unbreakable things. Lock the bike up in plain sight. The more traffic there is around your bike, the less likely it will be messed with. Busy streets don’t guarantee safety of course, but if you have it in a quiet, out of the way place that is secluded, it gives the thief plenty of time to steal the bike. Locking your bike up prevents others from just walking off with it. Your bike is a valuable item and leaving it unprotected is a sure way to lose it. With all of the choices available for bike locks, you may think that it is difficult to choose. We’ve taken the guess work out of the situation by sharing with you the things to look for when it comes to choosing the right bike lock. Securing your bike properly with a high quality bike lock will bring you peace of mind whenever you have to leave your bike unattended.